Crocodile Facts | Cool Kid Facts . When you think of a crocodile, the thought of a mean animal may come to mind. While these animals may not specifically try to come after humans, they are known for their aggressive behavior and strong jaws. Crocodiles are natural predators and it is best to just stay away! 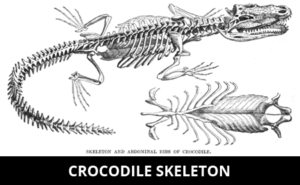 Keep reading to find out more facts about crocodiles. Crocodiles are reptiles, which means that they are cold-blooded, are covered in dry, scaly skin, and have a backbone. They are sometimes called ‘living fossils’ because they have been living on Earth since the time of the dinosaurs. Although they have been around for millions of years, their bodies have not changed very much during that time because they are such successful predators. Unlike alligators, crocodiles have very pointed snouts, and their upper and lower jaws are the same size. Crocodiles have webbed feet, which help them to be fast swimmers. Their bodies are also very streamlined, which means that they can slide quickly through the water to catch their prey. The size of a crocodile depends on its species, but some can grow to be over 23 feet long and weigh over 2,200 pounds! Crocodiles are large reptiles that need to live in areas with lots of water. Since they are cold-blooded, their body temperature changes to match the temperature around them, so they must live in areas that are usually warm or hot most of the time. Crocodiles are typically found in the tropics in Africa, Asia, North America, South America, and Australia. 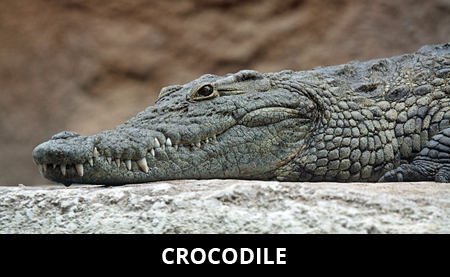 What do crocodiles like to eat? Crocodiles mostly eat food that is found in tropical climates, like fish, frogs, birds, reptiles, and other small animals. Some kinds of crocodiles are able to hunt larger types of animals such as deer, wild boar, and even buffalo. Even though crocodiles seem like they would be slow, they can move really fast on land and in the water. Crocodiles are called ambush predators, because they wait until their prey comes close to them and then they rush out and attack. They also have very good night vision and a strong sense of smell, so they can see animals easily in the dark and smell them from miles away. Crocodiles take advantage of other animals’ hard work, and they will steal food from other predators. Crocodiles have an extremely acidic stomach, which helps them to easily digest bones, hooves, and horns. Do crocodiles communicate with each other? Surprisingly, crocodiles are very social animals that prefer to live near each other. They are also very vocal, and they have unique sounds that mean different things. When a young crocodile is about the hatch from its egg, it will make a chirping sound which alerts the mother. As they continue to grow, these young crocodiles might give off a high-pitched call to warn others that there is danger nearby. Crocodiles will give off a hissing sound will signal a potential threat, and makes and females will give off different calls when they are trying to talk to each other. 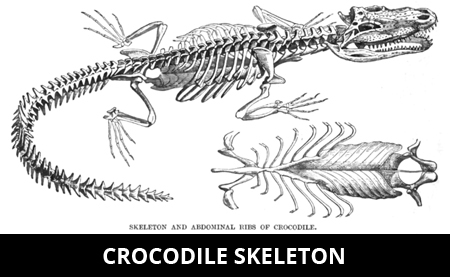 Crocodiles are a fascinating species of animal that has walked the Earth for millions of years. With their sharp teeth, strong jaws, swimming abilities, and hunting skills, they are excellent hunters and predators. While you might say they are somewhat scary, you can’t deny that crocodiles aren’t amazing animals!